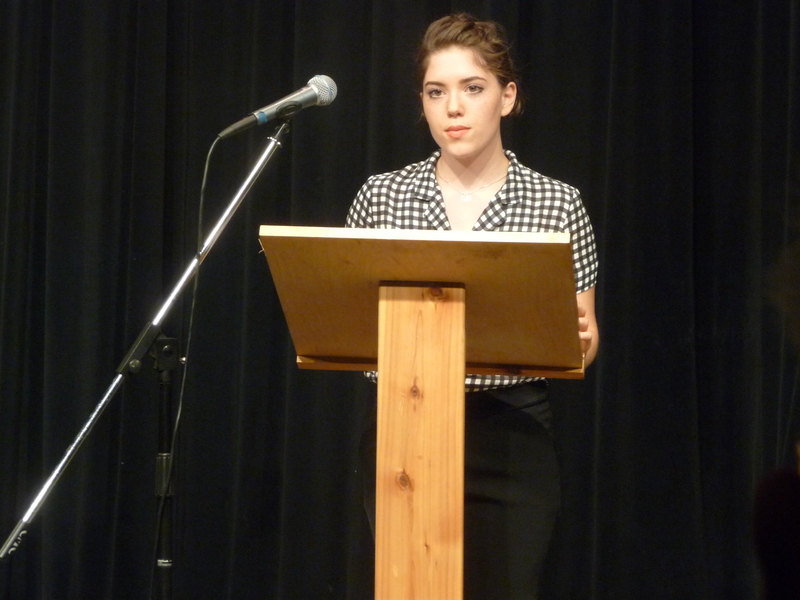 Liberty Bell High School’s Mackenzie Woodworth at an open-mic poetry reading, spring 2016. Mackenzie went on to win Liberty Bell’s 2017 competition and the Eastern Regional competition, and was an Honorable Mention at the state competition. The seventh annual Poetry Out Loud competition for Liberty Bell High School and Independent Learning Center students will be at 6 p.m, Wednesday, December 12, 2018 at The Merc Playhouse in Twisp. Admission is by donation. 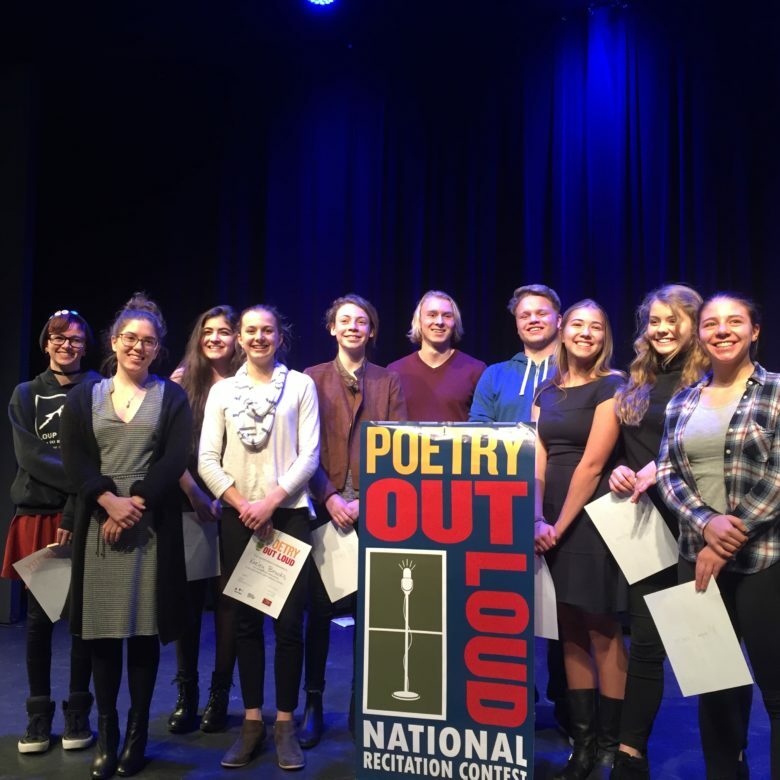 For the past six years, the Methow Valley has sponsored a robust Poetry Out Loud competition through a collaboration between Methow Arts and the Methow Valley School District. Poetry Out Loud (POL) is a national memorization and recitation contest that helps students master public speaking skills, build self-confidence, and learn about literary history and contemporary life. Each December, local high school students compete for slots at local, regional, and state POL competitions. Created in 2006 by the National Endowment for the Arts and the Poetry Foundation, Poetry Out Loud gives students an opportunity to work with recitation coaches such as Thome George and Rod Molzahn, who help students select poems from the anthology of allowed poems, provide them with structure for memorization, and coach them on performance skills such as projection, pacing, emphasis, and movement. If funding allows, the poetry coaches continue to tutor students throughout the duration of the competitions, as long as students are advancing to the next level. Beginning with Tom Zbyszewski in 2013, five times a Liberty Bell student has won one of two top slots at the regional competition and advanced to the state event; regional winners after Zbyszewski were Liam Daily (2014), Claire Waichler (2015), Lilly Cooley (2016), Mia Stratman (2017), and Mackenzie Woodworth (2018). The winner of the local competition will advance to the Eastern Washington Regional Poetry Out Loud contest in Spokane, and have a chance to make it to the state championship. The Washington state champion will advance to the Poetry Out Loud National Finals in Washington, D.C. The 2017 finalists from the classroom competitions, after the Merc recitation.